This is going to just be a quick review because, well, I inhaled it really quickly. Now, does my blizzard look over-blended? Well, it was, and usually I'm not a fan of this, but in this case it worked really well. See, there are so many brownie crumbs everywhere that you get a nice brownie vibe in every bite. To make up for the brownie obliteration, there are a healthy amount of chocolate chip bits everywhere keeping things texturally exciting. Yes, you do get a large chunk of cookie dough or brownie on occasion, I want to say 8-10 total but that's just a guess, but the strong brownie flavor is what kept this one tasty and exciting for me. 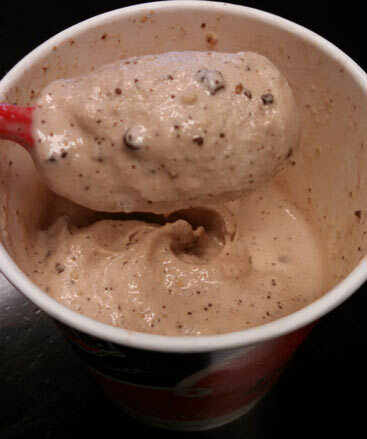 In fact, if you do get a chunk, the chocolate/brownie flavor will override it, but then you might get like a bit of cookie dough flavor on the back end of your bite if you actually got a cookie dough chunk. Sound good? To put this review another way, I liked it from the first bite to the last. I wasn't expecting anything groundbreaking here but this is a fine treat if you want a straight chocolate break (unlike many of their nuttier blizzards). As always, your mileage will vary greatly by server and location.